On February 11th 1995, Oasis played at the Deep Ellum Live in Dallas, USA. Listen to a superb recording of the gig below. 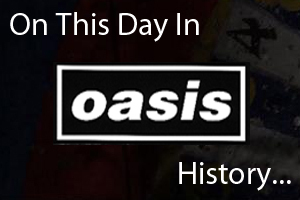 On February 11th 2000, Oasis recorded a set for 'Later Presents Oasis'. Played for the first time was 'Go Let It Out', 'Where Did It All Go Wrong?' and 'Gas Panic'. *The show was broadcast on April 1st 2000.